A kidney biopsy is the removal of a small piece of kidney tissue or cells. A pathologist (a doctor who specializes in tissue diagnosis) uses a microscope to look at the tissue for abnormalities. 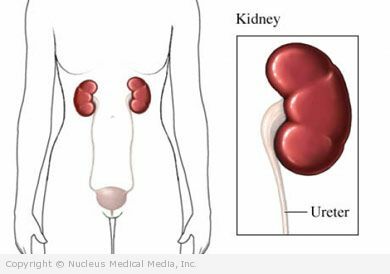 A kidney biopsy is done to diagnose a disease or medical condition. Once the tissue is examined, your doctor can make a diagnosis and provide treatment. If you had a kidney transplant, it may also be done to see if your new kidney is working properly. Be sure to discuss these risks with your doctor before the biopsy. Before the biopsy, your doctor may order urine tests, blood tests, and x-rays of your kidneys. You should ask your doctor when you can expect to know the biopsy results. Arrange for a ride home after your biopsy. Your doctor may ask you to fast or eat lightly before your biopsy. You will receive a local anesthetic to numb your skin. You may also receive a light sedative. This procedure is usually done in an outpatient setting with no need for an overnight stay. Your skin will be cleaned; this may be on your back or abdomen. The doctor will then inject a local anesthetic into the area where the biopsy will be taken. Next, your kidney will be located using either ultrasound or x-ray. Then, long needles will be inserted to collect tissue samples. A special instrument may be used to insert the needles. During the collection, you may be asked to hold your breath. Once the samples are collected, a bandage will be placed on your skin. Kidney biopsy – How Long Will It Take? Kidney biopsy – How Much Will It Hurt? The local anesthetic will block the pain during the biopsy. Afterwards, you may feel sore where the biopsy was taken. Ask your doctor which pain reliever is right for you. You will be monitored for a few hours after your biopsy. You will be asked to remain lying down to reduce the chance of bleeding. Your pulse and blood pressure will be monitored. Your biopsy samples will be sent to the laboratory for testing. Once you are feeling well and the doctor feels it is safe, you will be sent home. Rest to prevent bleeding. You should usually rest for the first 24-48 hours after the biopsy. Do not lift or exercise until your doctor says it is okay. Keep your biopsy site clean and dry. Check your urine. You may notice some blood in your urine. This is normal for the first 24 hours. If there is bleeding for longer than 24 hours or a lot of bleeding, call your doctor.